Food packaging is designed to be eye catching and to make us want to buy the foods that are on offer, tempting us with their promises and images. But it can be confusing when you’re looking at that enticing label, to figure out whether the food you’re looking at is good for you, contains nuts, or is out of date. There are strict rules governing what’s said on food labels, and manufacturers have to stick to them – one example is that if there’s a claim on the label that describes a food as low calorie, it has to be lower in calories than the usual version.So what do some of the more common food labels actually mean? When you’re choosing foods, it’s important to look at the labels to find out: The date instructions, such as 'use by' and 'best before' any defrosting (for frozen foods) and cooking instructions, and the correct storage and preparation instructions. When Must I Eat This By? The first thing you probably look at when you take a food out of the fridge is the date printed on the label, Even this can prove to be confusing though if you’re not quite familiar with food labelling terms. Use By - This is the most important date that you’ll find on a food and you’ll find it on perishable food items that may cause you to become ill if you eat them after this date. You should never eat anything after the 'use by' date on the packaging, even if you think it smells fine and there doesn’t seem to be anything wrong with it. Eating the food after the date on the label could actually put your health at risk. You also have to follow any storage instructions on the label to make sure that the use by date is effective. If you can freeze the item, the use by date on the label could be extended but you’ll need to refer to the guidelines on the packaging. Best Before - You’ll find ‘best before’ dates on the labels of most pre-packaged foods, and these are more quality guidelines than strict instructions. The only exception to this is eggs, which should really be eaten by their best before date because they sometimes contain salmonella bacteria, which could start to multiply. Most foods can still be safely enjoyed after any best before date. Eating them later won’t hurt you, although the food might have lost a little of its flavour. As with the use by dates, a the best before date means nothing unless the food is stored properly, and the instructions on the label, like 'keep in the fridge once opened' are followed properly. Sell By and Display Until – these are for the shop staff and not the public, so you can safely ignore these. 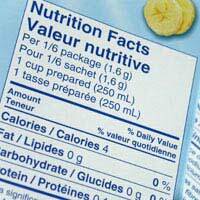 Date marks on food labels that say 'display until' or 'sell by' can be confusing as they often seem to be printed right next to the 'best before' or 'use by' dates which do have significance. Many foods are labelled with claims about health and nutrition that are designed to appeal to people on certain types of diet, or generally those who are interested in healthy eating in general. You should always be cautious of claims that are made on labels because some of them aren’t yet legally defined. Some terms have been legally defined, such as 'low-fat' which quite simply means that the food has to contain no more than 3g of fat per 100g. Claims that say things like ‘can help to maintain a healthy heart' have yet to be defined in law so as far as food labelling is concerned, they are pretty meaningless. The future for food labelling.